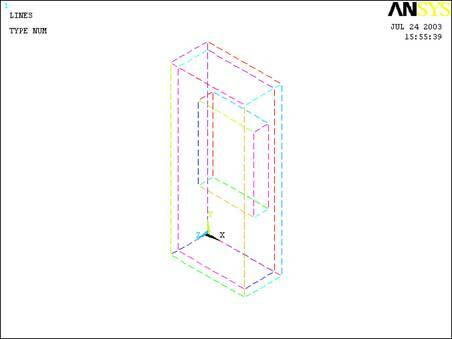 In this example you will learn to build and assess #3D geometries in heat transfer by modeling an object subjected to requirements and specific boundary conditions. 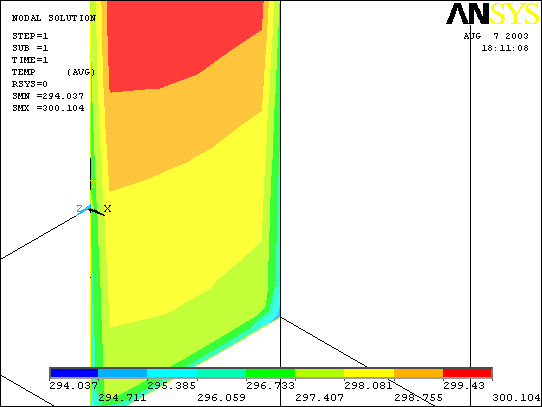 Using ANSYS will allow you to output the temperature distribution in an extremely simple and accurate way. 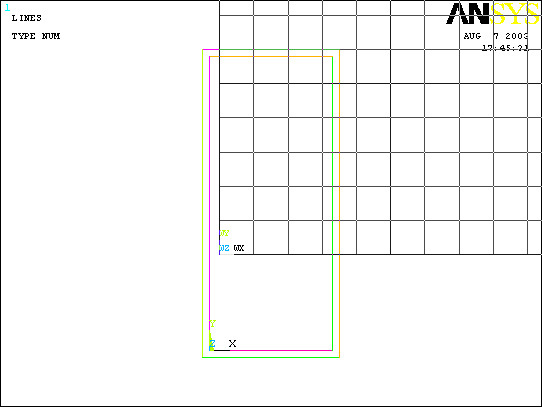 · We assume that our phone is a rectangular solid, with filleted corners as they appear in the image. · All units are S.I. 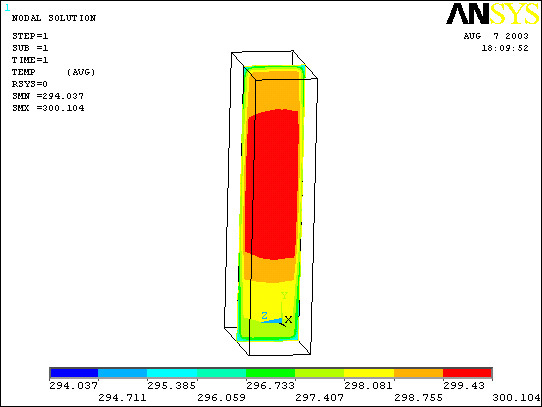 2) All faces except that of the battery have convective boundary layers. 3) The battery generates heat at a rate of 50 W/m^2/s. 5) Heat is uniformly generated in the bock at a rate of 20 W/m^2. · Objective: To determine the nodal temperature distribution and create contour plot. · Click on ANSYS 6.1 in the programs menu. · The following menu comes up. Enter the working directory. All your files will be stored in this directory. Also under Use Default Memory Model make sure the values 64 for Total Workspace, and 32 for Database are entered. To change these values unclick Use Default Memory Model. · The first step is to create the inner volume to represent the space in the phone that is occupied by the microchips and transistors. · Enter the values shown in the figure above and then click OK. Note that we are using a spacing increment of .1 inches or 2.54 millimeters. This will help in a modeling step. · Enter the values as shown and click OK.
· Now change the view to isometric mode, using Menu>Plot Controls>Pan Zoom Rotate and by clicking the ISO button. The plot should have zoomed to the new part. · The next step is to create the outer volume. · Go to Utility Menu>Workplane>Offset WP by increments and click these buttons to offset the workplane by -.1 inches in each direction. This will enable you to create the inner volume easily. 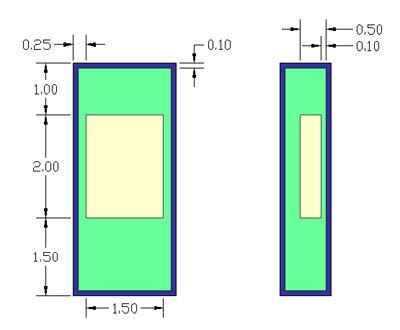 Note that these dimensions are simply the previous ones, minus 0.00508 which is .1x2 inches. · If you messed something up, remember not to select Pick All when deleting anything now, since you don’t want to destroy the model of the inner volume. · The next series of steps involves creating the volume for the battery. 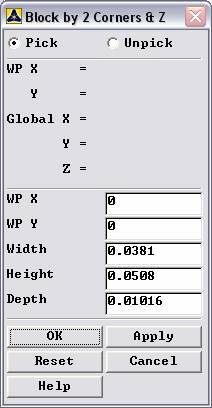 · First, use Offset WP by increments and increment the Workplane by two positive increments in the Z direction. 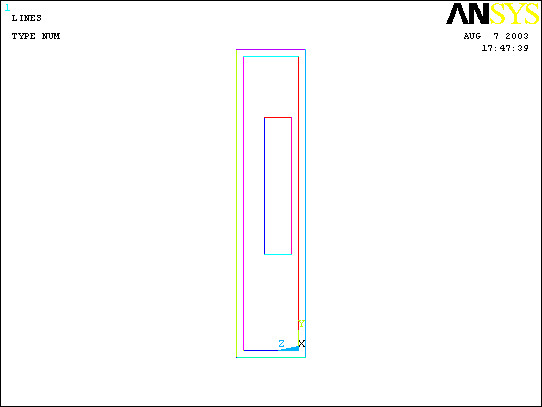 Next, change the snap and grid increments of the workplane settings to 0.0381 m (1.5 inches, the distance between the bottom of the phone and the beginning of the battery). Use Offset WP and offset in the Y direction by one positive increment. Next, change the increments once more to 0.00635 m (0.25 inches). Displace the WP in the X direction one positive increment. · The workplane will appear here: Note that The Pan Zoom Rotate settings here are “Front” instead of ISO and only the lines are plotted: Basically, the image should look like the CAD drawing from the top of the tutorial, and the bottom corner is where the battery will be referenced from. · The completed model will look like this: (note that I did not replot the volumes because we wouldn’t be able to see any of the inner volumes! 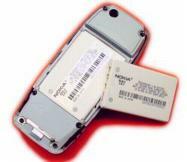 · First select the outside layer and the inside layer (not the battery!) and hit Apply. Then select the inside volume and the battery and hit OK. This should resolve all the volumes. You can test this but plotting lines and then trying the step again, the volumes should each be selected separately… if so, then hit cancel and move forward. 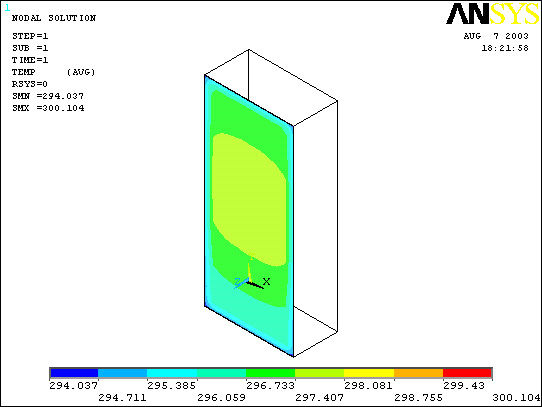 · Now that we have built the model, material properties need to be defined such that ANSYS understands how heat travels through this composite solid. · Click Preprocessor>Material Props>Material Models. · Fill in 84.8 for Thermal conductivity. This defines the conductivity of Lithium and correlates material 1 with it. 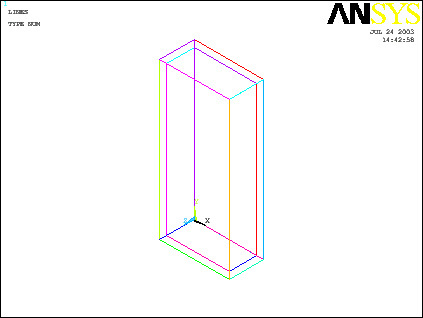 Click OK.
· Now that we’ve defined what material ANSYS will be analyzing, we have to define how ANSYS should analyze our block. 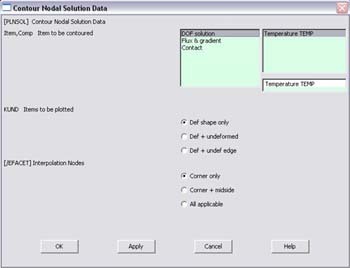 · Click on Thermal Mass Solid and select Tet 10node 87. Click OK. Close the 'Element types' window. 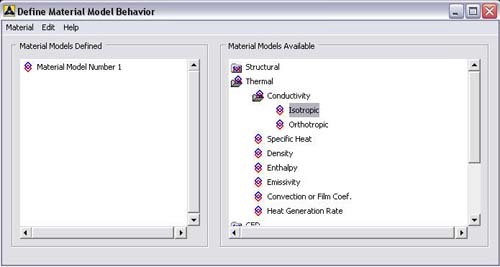 · Now we have selected Element Type 1 to be a Thermal Solid 10node Element. This finishes the section defining how the part is to be analyzed. 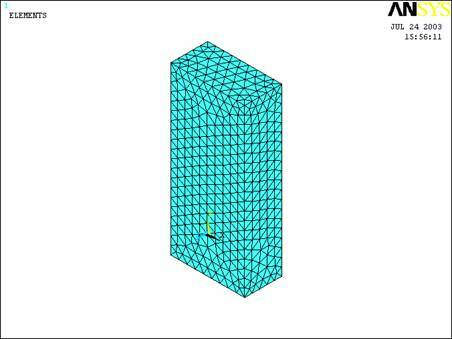 · This section is responsible for telling ANSYS how to divide the block such that it has enough nodes, or points, to analyze to make an accurate enough analysis. · Go to Preprocessor>Meshing>Size Controls>Manual Size>Global>Size. In the menu that comes up type 0.006 in the field for ”Element edge length”. 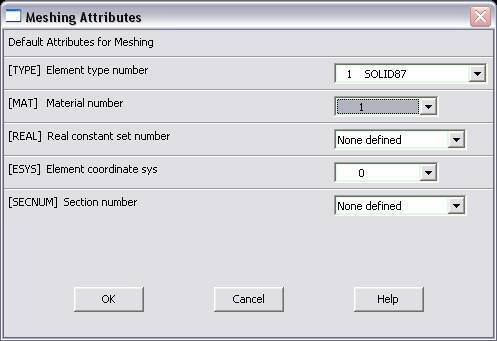 · Click on OK. Now when you mesh the figure ANSYS will automatically create square meshes that have an edge length of 0.006m along the lines you selected. · A popup window will appear on the left hand side of the screen. 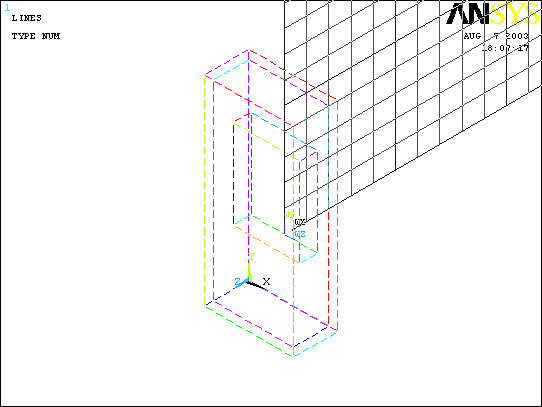 This window allows you to select the area to be meshed. · Click anywhere within the lithium battery you created to select the volume and then click OK in the pop-up window. 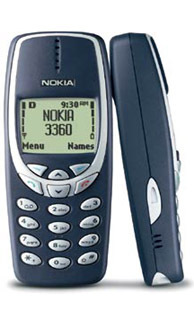 · Return to Default Attributes and this time, select Material Number 2, to model the innards of the phone. · Finally, choose material 3 and mesh the plastic casing. · Now that we have modeled the phone and defined how ANSYS is to analyze it we will apply the appropriate Boundary Conditions. · First we’ll apply the Convection Boundary layer around the model. For this click Convection>On Areas within the Thermal Load category. · A dialog window will appear on the left hand side of the screen. This window allows you to select the areas you wish the load to be applied. · Fill in the h value in the Film Coefficient blank and the Air temperature in the Bulk Temperature blank. Click OK when finished. · The next step is to add the constraint of heat generation. · Preprocessor>Loads>Define Loads>Apply>Thermal>Heat Generat>On Areas. (Heat Generat is just short for Heat Generation). You select Areas again because you have to apply this condition uniformly across the block. · Click anywhere within the area to select it and then click OK.
· Now we have applied all the necessary boundary conditions so we move on to the Solution. 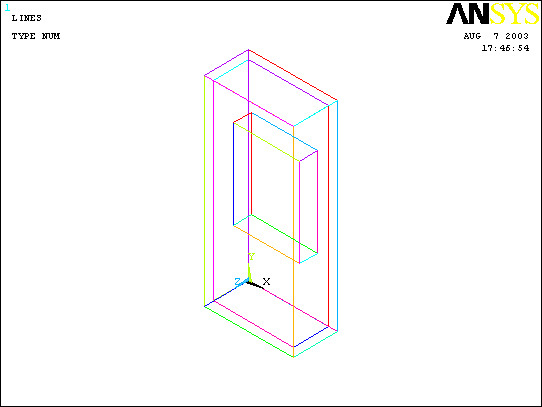 · Go to ANSYS Main Menu>Solution>Analysis Type>New Analysis. · Select Steady State and click on OK.
· Go to Solution>Solve>Current LS. · An error window may appear. Click OK on that window and ignore it. 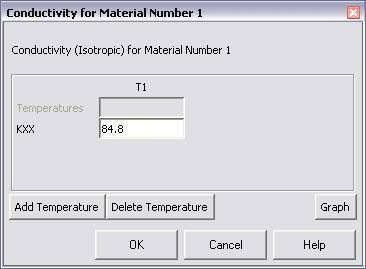 · Within this window one can numerically find the maximum and minimum value of the temperature within the block. Check the entries and hit OK. The result should be something like below! Now offset the WP back to the original angle (rotate in the –Y direction by 90 degrees) and then choose Utility Menu>Workplane>Offset WP to>Global Origin. 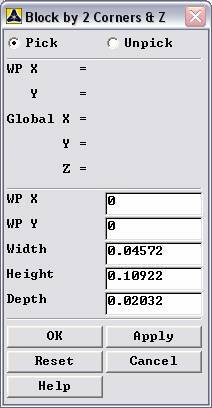 Change the WP settings to 0.02261 and offset the WP once more by 1 snap increment in the +Z direction. If you replot the contour, you can see that the temperature of the phone near the ear will be on the order of 296 K which is 73.13 degrees Fahrenheit. Some people might find that uncomfortable. This of course, is a crude model of the phone as most of us with phones have experienced more discomfort. Note that the phone is also warmer in the middle area, directly across from the battery…which is sensible and also more likely to be noticed in general.